Clean the wine that spilt straight away; as the longer you leave the wine on your carpet the harder it will be to get rid of the stain. So act fast! As soon as you see the spillage, get a paper towel and dab the stain to lift up as much liquid as you can before it sets. Make sure to dab the stain lightly and don’t rub over and back. 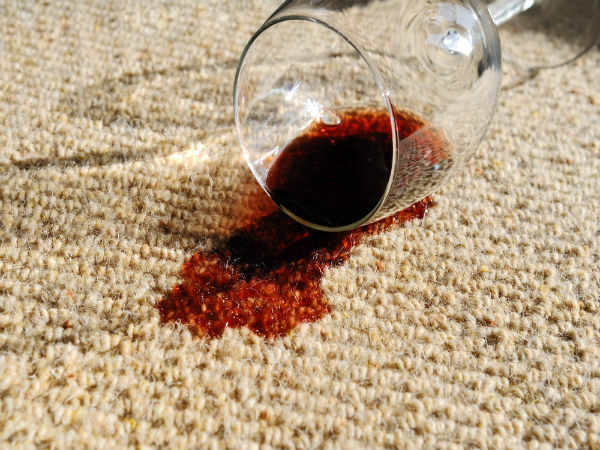 Rubbing may lift most of the wine but could also soak the remainder further into the carpet, making it harder to get rid of the stain or could even make the stain larger. Shake some salt on the stain while it’s still wet. Give it a good dab as this should take a lot of the wine out of the carpet. If it doesn’t; shake more salt over the spot where the stain is. If your stain has gone dry, pour some water on it first before you add the salt as the salt only works by absorbing the stains moisture. Leave the salt to sit for a while. As the salt absorbs the wine, it will start to turn a pinkish colour. You are ready then to continue when the stain is fully dry. If you choose to leave the treatment for a longer time, it will do no harm as it can’t get any worse. So let the salt sit until the next day if you want. Next get rid of the leftover salt and hoover up the small bits of salt that may be still on your carpet to have it fresh and looking new again. By now the stain should be gone or at least barely noticeable. Mix 1 tablespoon of washing up liquid, 1 tablespoon of white vinegar and 2 cups of warm water in a large bowl. Stir all of the ingredients together. It is very important that you use only white vinegar for this as some other types of vinegar can cause stains. Next using a clean cloth, soak it in the mixture and dab it onto the stained part of carpet. The mixture will then soak into the carpet fibres, which should loosen the stain. Then get a second dry cloth to dab the solution. Finally soak a third cloth in cold water; press it into the stained area to dilute the wine, or you can pour a small amount of water onto the stain. Get your dry cloth and dab to soak up the water. Keep repeating this if you need to. If you want maximum effect you can do the above steps several times. Sometimes wine stains can dry before you even realize and they won’t come out with any of the above methods. So you may need to call in a professional for the job! You don’t have to panic though as professional carpet cleaners have their own equipment and cleaning products to help with these types of problems. So no need to panic! Good luck and hope these tips will help.